Microsoft BlueTrack technology combines the power of optical with the precision of laser for remarkable tracking on virtually any surface. Leave the Nano Transceiver plugged in when you're on the go, or stow it in the mouse. 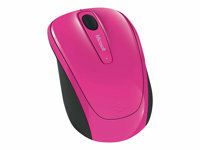 Use your mouse with your left or right hand - ambidextrous design makes it comfortable either way. Keep moving with a transceiver that stays in your mobile PC when you go and a mouse that works on more surfaces with Microsoft BlueTrack technology!